Brass medals are stamped in this workshop. First, the stamping die of the medal is set up in a 400-tone press. The metal sides are stamped one by one under the press and then put in an annealing furnace for about 20 minutes to eliminate stress in the metal. The number of stampings depends on the importance and the positioning of the reliefs on the face or the back of the medal. We can stamp a medal 10 successive times, with a break in the annealing furnace between each stamping. 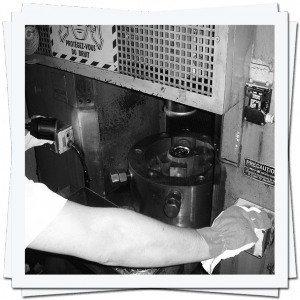 After the stamping, solid medals in raw metal are milled one by one to remove the excess of metal and get a perfect edge. The “0 defect” quality of our metal, the very sharp and accurate relief of our motifs and the cleanness of the medals edges set the medals stamped in our workshop apart from the rest.